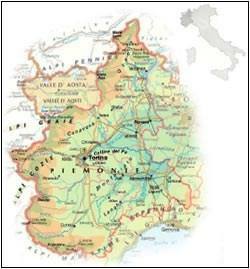 Piemonte, the north western corner of Italy, borders on France to the west and Switzerland to the north. To the south it is separated from the Mediterranean by the narrow coastal strip of Liguria, while to the east lies Lombardia and the valley of the river Po. On all but this eastern side, Piemonte is ringed by Alpine mountain ranges: the name Piemonte means 'foot of the mountain'. Although several other regions outstrip it's total annual wine production in terms of volume, Piemonte is a clear leader in winemaking prestige with no fewer than 50 different DOC(G)s, significantly more than any of its rivals. Although there is a growing interest in white wines, and despite the presence of Asti Spumante, Piemonte remains at heart red wine country. The zone is not a large one: the Langhe occupy no more than 2,000 square kilometres and the Monferrato 4,000. These hills, which cover the north-eastern section of the province of Cuneo, and the south section of the province of Asti are bordered by the plain of Turin to the north, the Oltrepo' Pavese hills to the east, the plain of Cuneo to the west and the Maritime Alps of Liguria to the south. The area is traditionally subdivided into two distinct zones: the alta (upper) and bass (lower). The exploitation of the former is a relatively recent phenomenon. Large areas are still covered in forests of pine, fir, oak, elm, chestnut and beech, punctuated by the occasional patch of land cleared for agricultural purposes.